A car theft in the Netherlands, a seemingly insignificant note that was found in Molenbeek, and a shop for swimming pool equipment in the North of France. These are the three ingredients of the best clue there ever has been to thwart the Paris and Brussels attacks — a new investigation by the Belgian newspaper Het Laatste Nieuws reveals. A lot has been written already about the clues that security services missed in the run-up to the Paris and Brussels attacks — clues that could have prevented the bloodshed by Islamic State. 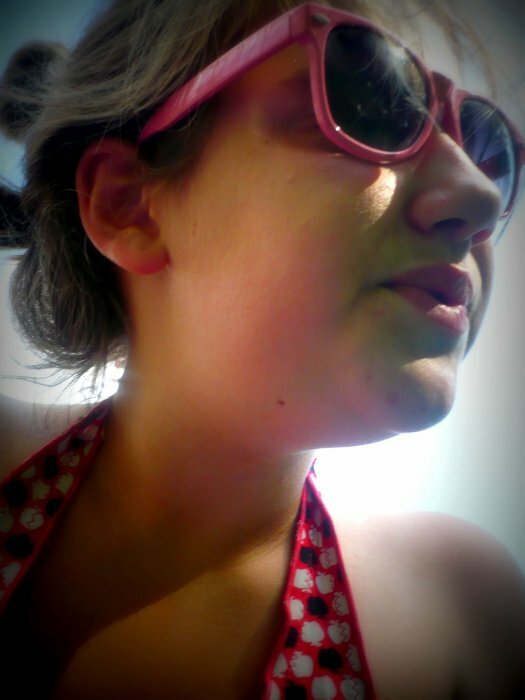 Could have. In hindsight, it is easy to list the mistakes. Yes, it was known to the police that Salah Abdeslam had started to radicalize. But at that time, it was the case with tens, if not hundreds of Belgian Muslims like him. And yes, only 22 days before the Paris attacks, a search took place in the house of Khalid El Bakraoui because he tried to obtain kalashnikov chargers. But he was known as a gangster and in the end no weapons were found. About one clue, however, nothing has been published yet — and that clue is likely the very best chance authorities missed to detect the terrorist cell. It started with the theft of a car in a small village between the Dutch rivers Maas and Waal. It was a silver colored Audi S4 built in 2003 that disappeared in the night from August 10 to 11, 2015 at a parking lot in Rijswijk — part of the municipality of Woudrichem and not to be confused with the much bigger town of Rijswijk near The Hague. “Klerelijers”, a friend of the owner reacted at a notice on Facebook, using an equivalent for “assholes” that is endemic for the Netherlands — while another one hurled: “Your country will be proud of you”, easily assuming that the thief was of foreign origin. The rightful owner got his car back after it was found in the Brussels municipality of Molenbeek, and during a subsequent house search a handwritten note was found. 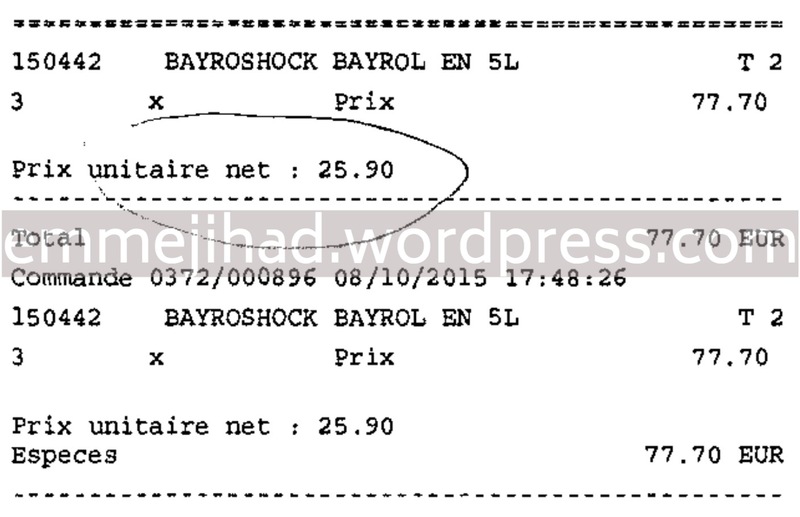 It seemed of little importance: “Bayroshock without chlorine”, it mentioned, followed by the addresses of two shops for swimming pool equipment in the North of France. 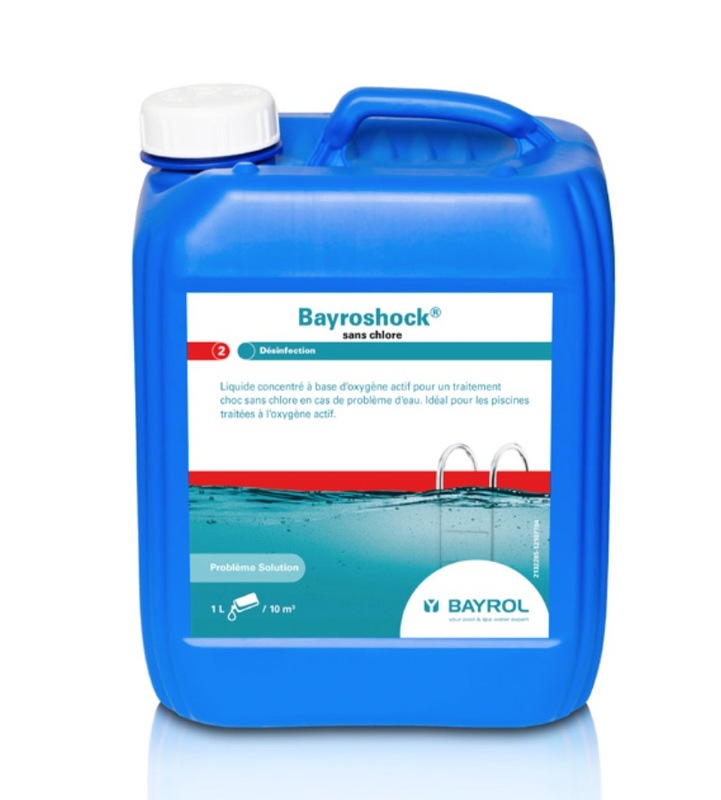 Bayroshock is a product against algae that consists of hydrogen peroxide at a concentration of 34%. Apart from being recommended for the treatment of pools, that same substance is also a main ingredient of TATP. Triacetone triperoxide is the explosive often called ‘the Mother of Satan’ and known as a terrorist’s favorite since the failed attempt by ‘shoe bomber‘ Richard Reid to blow up a plane between Paris and Miami in December 2001. The man in whose house the note was found, is Ahmed Dahmani — a naturalized Belgian citizen of Moroccan descent. 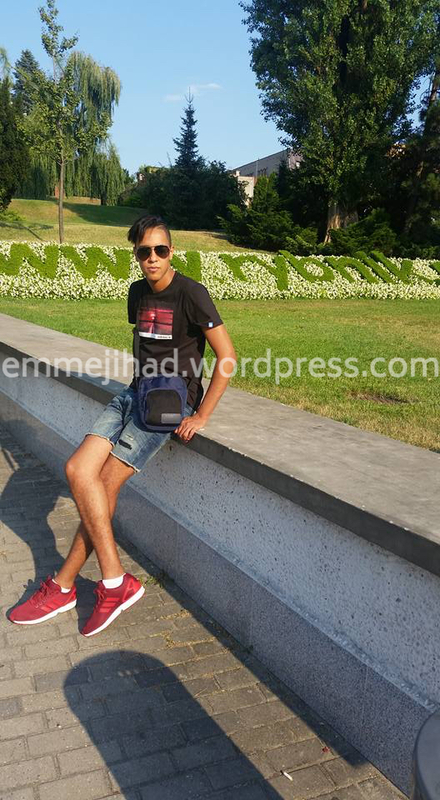 He was born in 1989 in Al Hoceima, a town between the Rif mountains and the Mediterranean Sea. In 2015, he was living in a fourteen-storied building in the Molenbeek ‘Zone du Canal’ — not the kind of address where a swimming pool owner can be expected. He was mainly known to the judiciary as a multi-recidivist criminal, who was caught for theft already at the age of twelve. The latest of the 51 cases in which his name appeared, was about a massive traffic in hard drugs between Belgium, France and Luxembourg. But there were signs of radicalization too, much stronger signs in fact than those present at that time with his childhood friend Salah Abdeslam. With Abdeslam, he underwent an identity check on board of a ferry between Patras in Greece and Bari in Italy only a week before the car theft in the Netherlands. Now, we know that they conducted one of many travels along the refugee route that was used by the Islamic State to smuggle terrorists to the West, but then it understandingly did not raise a particular suspicion yet. Ten days after the search that uncovered the note, however, Dahmani was named in a report about radicalism. 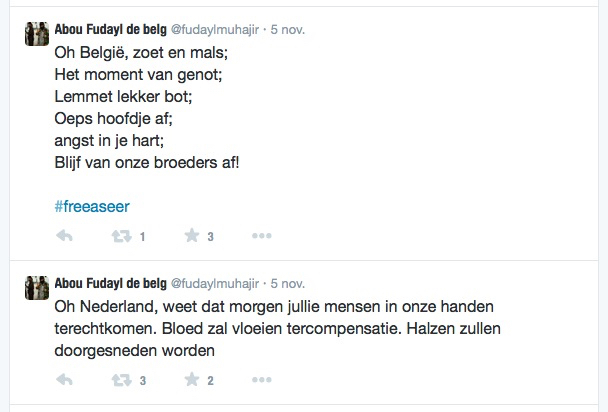 Written by a motorized patrol of the Brussels police that had apprehended a suspected candidate for the Syrian jihad. Friends of the suspect had tried rather brutally to prevent that arrest, and Dahmani was one of them. At Facebook, Dahmani did not hide his beliefs. There, he complained in 2014 already that the word extremism was “invented by enemies of the Islam”, while posting a quote that the Islamic State often uses to recruit criminals like him for the jihad — the one in which the second caliph Omar ibn al-Khattab declared: “Sometimes the people with the worst past create the best future”. Dahmani also posted Islamic State videos, and three days before a terrorist attack was foiled in Verviers — in January 2015 — he threatened: “One day everything will be paid.” He did all of that under the cover of a pseudonym, but his contacts with a suspect in the Verviers case could have lead to his identification back then already. In Dahmani’s family tree, radicalism became obvious almost a decade ago. His older brother Mohamed — who basically raised him instead of their always absent father and their chronically ill mother — was named in a terrorist case as early as 2009. He was investigated for his contacts with the suspects of a bomb attack in Cairo that killed a French teenager — the same suspects behind the earliest plot against the Bataclan in Paris. Mohamed Dahmani was never charged, but by the time his brother Ahmed entered the scene, at least three of Mohamed’s friends had left for Syria. One of them departed from Brussels in the company of the later terrorist commander Abdelhamid Abaaoud. And in 2012 already, Mohamed himself was known as a patron of Shariah4Belgium, asked explicitly for his blessings when leader Fouad Belkacem wanted to expand his recruitment from Antwerp to Brussels. Altogether, there were plenty reasons to raise the alarm when Ahmed Dahmani showed his interest in an ingredient for bombs. 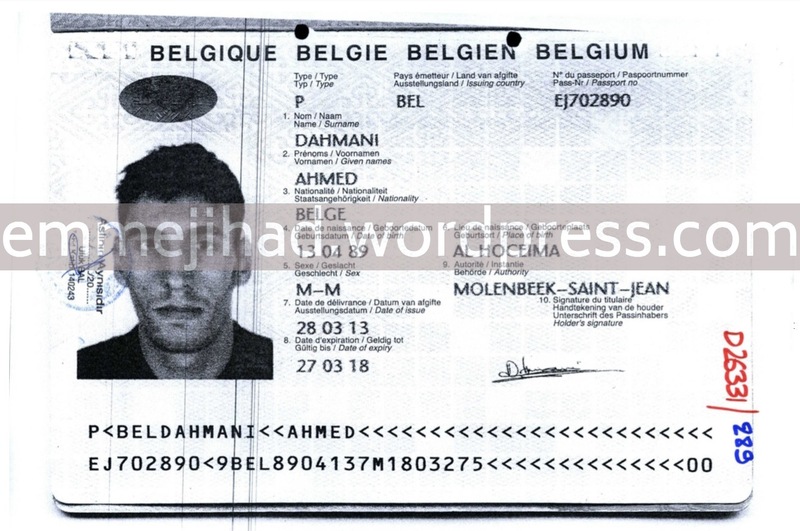 But that did not happen, and at the 8th of October 2015 — a month after the note of Dahmani was found — a BMW left Molenbeek towards the North of France. At 4h04 that afternoon, the car was caught by a speed camera at the A2 highway in Neuville-sur-Escaut. The license plate would later learn that the vehice was rented by Salah Abdeslam, and the GPS revealed two stops: at 5h02 in the rue Maurice Thorez in Saint-Sauveur, and at 5h44 in the rue Ferdinand de Lesseps in Beauvais — the two shops mentioned on Dahmani’s note. The manager described the two men as North-Africans between 25 and 30 years old. Both were of average build, had short hair and a short shaved beard. One of them was wearing a jacket over his sweater, the other one a bodywarmer. They spoke French — also when they talked to each other — without a particular accent. “They expressed themselves like youngsters do, but they weren’t impolite”, the manager said. Confronted with the pictures of known suspects, he thought to recognize Salah Abdeslam. But he wasn’t sure. Altogether, the two men spent no more than seven minutes in his shop, after which they made a fuel stop at the Total station of Hardivillers and returned to Molenbeek. French investigators are fairly confident that their purchase has served to fabricate the bombs that were used for the attacks in Paris on the night of 13 November 2015. There were eight explosive belts, of which two have failed to detonate. Each of them contained between one and two kilograms of TATP, and according to explosives experts of the French police, the terrorists could make ten kilograms with fifteen liters Bayroshock. In Belgium, the EU directive banning the sale of hydrogen peroxide in concentrations above 12% to private customers was passed into law in July 2016. But in France, a softened version entered into force last year, just requiring registration for private purchases. Ahmed Dahmani is in Turkish custody now. He took a flight in Amsterdam on the morning after the Paris attacks, with a ticket that was bought a few hours prior to the bloodbath — indicating that he knew what was going to happen. When he was arrested near Antalya on the 16th of November 2015, he was still in the possession of his Belgian documents, including membership cards of the Christian trade union CSC and the Grand Casino in Brussels. In the meantime, however, he had also bought a false Syrian passport with the name Mazen Mohamad Ali, and the WhatsApp conversations on his phone revealed that he had planned to reach the territory of Islamic State. In December 2016, a Turkish court convicted him to ten years and nine months in jail for membership of a terrorist organization. After he has served that sentence, Belgian and French extradition requests are awaiting him. They look like students taking a gap year. Traveling through Europe to get a sense of its culture, to party, and to catch a holiday romance. But they are in prison now as suspected scouts of the Islamic State. The Belgian daily newspaper Het Laatste Nieuws delved deep into their Facebook accounts, and unearthed an alarming strategy. Mourad Taleb left his home in Casablanca on September 14, 2014. He had eagerly looked forward to his journey. 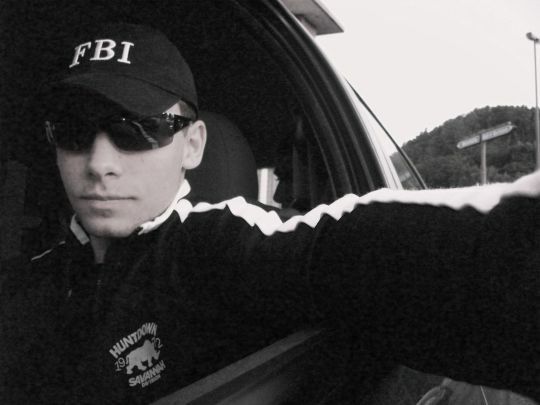 Eight days earlier, he had posted a picture on his Facebook page which showed him looking through a half-open door. “Soon”, he wrote below it. On that photograph, he still wore the neatly ironed shirt of his job in the classy business hotel Le Palace d’Anfa. Once arrived in Istanbul, he had changed it for a groovy jeans and a hipster shoulder bag. Yes, he is a Muslim from Morocco. But no, he wasn’t on his way to Syria. During the following months, Taleb did travel through Greece, Macedonia, Serbia, Hungary, Austria, the Czech Republic and Poland. His journey can be reconstructed step by step thanks to the check-ins on his Facebook account, where he is alternately posing with historical monuments and in fancy discotheques. He shows how he went swimming, bowling, pooling, and attended a match of the soccer team Rapid Wien. 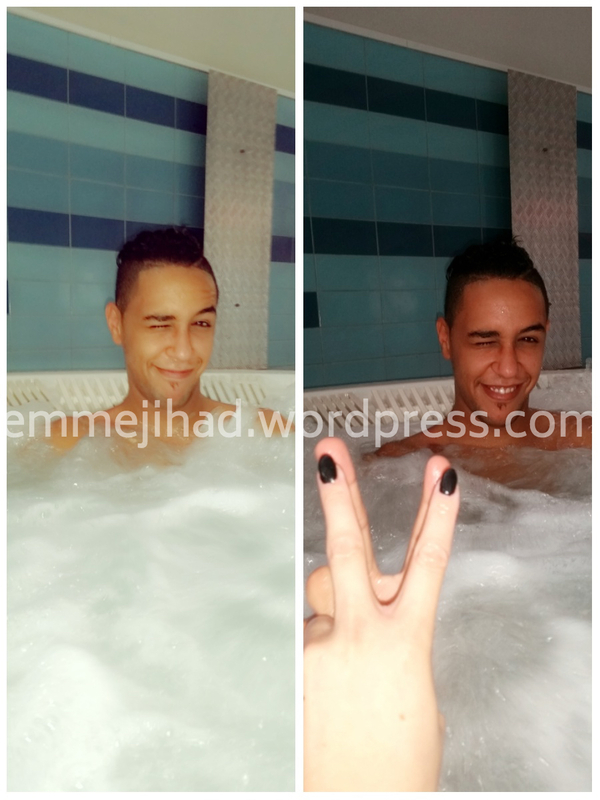 In Poland, he picked up a girlfriend with whom he even posed while having a bath — and with whom he even has married, it seems. She wasn’t an Islamic girl, and there are very few signs of religion on his Facebook page too. Very rarely, he posted something in Arabic like the “we all belong to Allah and to Him we shall return” that is recited when a relative has passed away. But anyway, on the 5th of September 2016, he was arrested in the Polish town of Rybnik for belonging to the terrorist group Islamic State. During his time in Turkey, he reportedly had met Abdelhamid Abaaoud, the notorious coordinator of Islamic State attacks from Molenbeek in Belgium. According to the complaint, that was cited by the Polish daily Rzeczpospolita, they met in Edirne near the border with Greece. 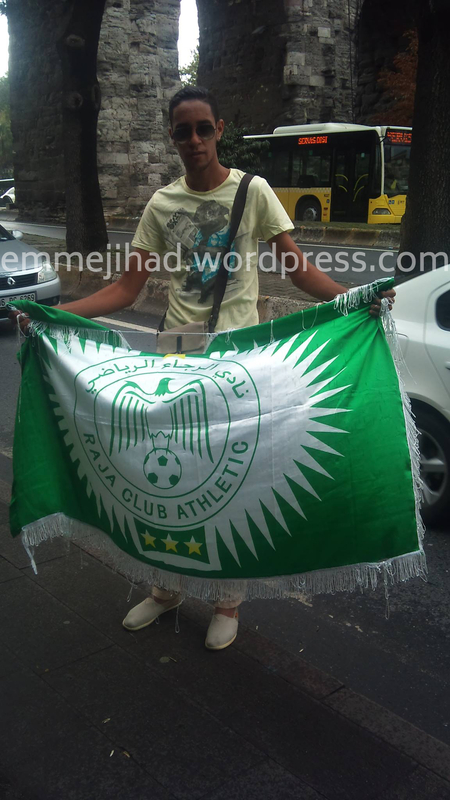 On his Facebook page, Taleb was pictured in Edirne on the 2nd of October 2014 waving a flag of ‘Raja Club Athletic’, his favorite Moroccan soccer team. 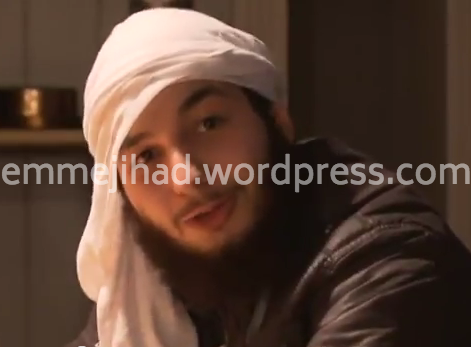 Apart from Abaaoud, he is said to have met two other Belgians there: Khalid Ben Larbi and Soufiane Amghar. Both were killed a few months later in the Belgian town of Verviers, during a police operation that foiled a bloody attack. The journey of Taleb reportedly was nothing less than a reconnaissance operation. Commissioned by Abaaoud, who was already planning several Islamic State attacks in Europe by then. For that, he used several scouts. Most of them were traveling through Europe under the disguise of Syrian refugees, reporting back to Abaaoud about their means of transportation, places to stay, and most important: how they passed borders and other controls. Abaaoud had a special Facebook account to keep in touch with them. According to Le Monde, Bilal Chatra — a scout arrested in the German town of Aachen in April 2016 — had 429 messenger conversations with that account in one month time. While Abaaoud was killed shortly after the Paris Attacks of November 2015, his account is still online. It is called Protocole Walodiwalo (with ‘walodiwalo’ meaning ‘nothing for nothing’ in Moroccan Arabic) and doesn’t show anything of a religious nature. The profile picture is that of a black African man laughingly exposing his ruined teeth, with a protracted “hahaha” written in Arabic over it. Still on the friends list of the account is Mourad Taleb, while we found out that Taleb has also been in touch with Chatra using social media. Talking about friends: apparently Taleb was acquainted with Redouane Sebbar in 2011 already. A rather unsuspicious time, but Sebbar — who also hailed from Casablanca — became a scout of Abaaoud too. He was arrested in a refugee center near the German city of Hamburg in December 2016 and in October of last year turned over to France. French investigators think Sebbar was implicated in the botched attack on a Thalys high speed train in August 2015. He traveled back and forth with that same Thalys between Brussels and Paris five days earlier, supposedly on the orders of Abaaoud. The Facebook account of Redouane Sebbar is revealing that he left for Istanbul on December 16, 2014. He crossed the border with Greece on January 4, 2015 — three days after Taleb — and traveled through Serbia, Hungary and Austria to end up in Germany in May 2015. He wasn’t posing that much, but he also looked as a tourist. He too made friends everywhere along his way — not only Muslims — and his check-ins include fitness centers, shopping malls, ice cream parlors and a well-known gay bar in the Greek city Thessaloniki. The cover that the scouts were using, is so convincing that it’s obvious to think: they can’t have been aware of what they were contributing to. Maybe they were fortune hunters, paid by Abaaoud without knowing what he was planning. They must have sensed that it wasn’t completely right, but the worst they could imagine may be that Abaaoud was trafficking drugs or something like that. If they knew the full extent of his intentions, how on earth they were able to keep up appearances while lying in their Western lover’s arms? But if Polish investigators are right, at least Taleb knew very well that he was working for the bloodlust of the Caliphate. On his mobile phone, instructions for making explosive devices and pictures of potential targets were found —as the Polish daily Rzeczpospolita reported. On top of that, Taleb called Muslims who were grieving for the victims of the Paris attacks “bastards” and “dogs” in intercepted text messages. It is highly disturbing that the scouts of Abaaoud have been able to conceal their true intentions so well, since Facebook is loaded with similar looking profiles. Browsing through the friends list of Sebbar for instance, we found P.L. — a young man from Casablanca who was in Greece in March 2015. One month later, he traveled through Hungary, in May 2016 he stayed in a German refugee center, and just one month ago he settled in Paris. He’s not only on the friends list of Sebbar, but also on that of a Moroccan living in München and linked to Abaaoud’s account. There’s no evidence whatsoever that he too is implicated in terrorist activities. Most likely he’s a genuine fortune hunter, who may have left Morocco as a friend of Sebbar, but without being radicalized himself halfway. But because the scouts of Abaaoud were that efficient in building a cover, all similar migrants are becoming a bit suspicious again. Shortly before he died, Abaaoud declared that 90 terrorists had entered Europe already. Was he only bragging? Possibly. But there’s still a lot of investigations to do, that’s for sure. The Belgian newspaper ‘Het Laatste Nieuws’ has gained exclusive access to the interrogation reports of Tarik Jadaoun. 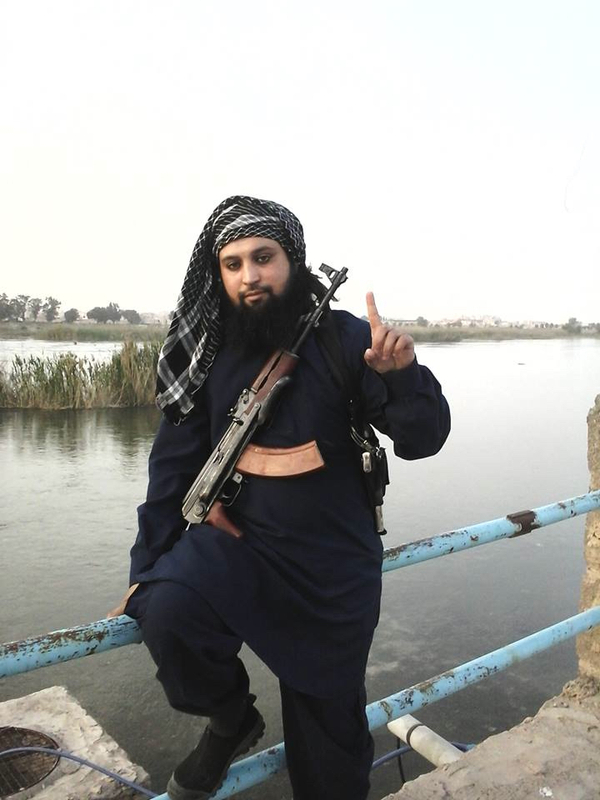 Better known as ‘Abu Hamza al-Belgiki’, he is a Belgian member of Islamic State detained in Iraq. Here’s a resume of what we have in published in Dutch — with some additional notes about people Jadaoun confessed that he has met. Belgium has very good reasons to hope that Tarik Jadaoun (29) never will reappear in the country. According to his own confessions in Iraq, the Islamic State operative was extensively involved in terrorist plotting against the West. He even volunteered to return for an attack himself. “Journalist’s talk.” That was Jadaoun’s reaction to reports about his involvement in terrorist plots when he was interviewed last month by Belgian state television. “It’s not my fault that there were attacks in Belgium and France”, he said. 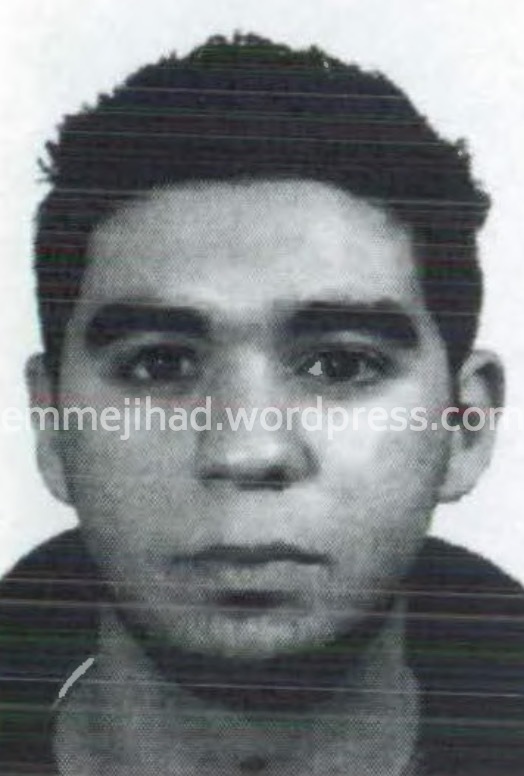 “I didn’t give the orders for that.” He tried to picture himself as a follower, whose only mistake was his choice for IS — full of regret and very much willing to cooperate with Belgian security services, if they help him to escape an almost certain death sentence in Iraq. Interrogated by Americans however, Jadaoun told a different story. He admitted his involvement in several terrorist plots — two of which have lead to deaths on European soil — and he even confessed that he had volunteered for an attack in Belgium or France himself. According to the interrogation reports, Jadaoun was apprehended on the 12th of July 2017 at 6 AM in al-Farooq, a neighborhood in the west of Mosul liberated from IS a fortnight earlier. He was arrested without weapons, equipment or documents – suggesting that he had gone into hiding. But he hadn’t suffered hardship yet, since his weight of 135 pounds is healthy for a man of 68 inches tall. 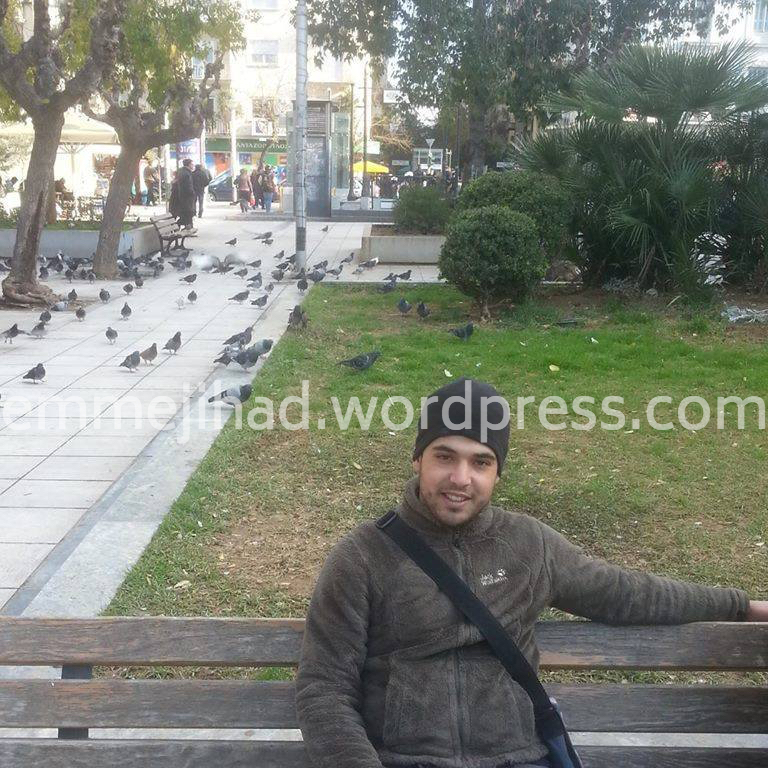 Jadaoun declared that he had worked as a medic in a makeshift hospital in the Hayy al-Maydan neighborhood from early June until two days before his arrest. On the 10th of July, that hospital was hit by a coalition air strike, causing the death of his pregnant wife and their one year old daughter. He had two spouses at that time – the one who died was a Belgian citizen of Algerian descent. The other is an Iraqi who had fled Mosul with her parents early last year, but was still in touch with Jadaoun via social media about ten days before his arrest. If he is telling the truth, Jadaoun has worked as a medic for most of his time with IS. That was also the case in Kobanê, he said, the Kurdish town in Syria captured by IS in September 2014. 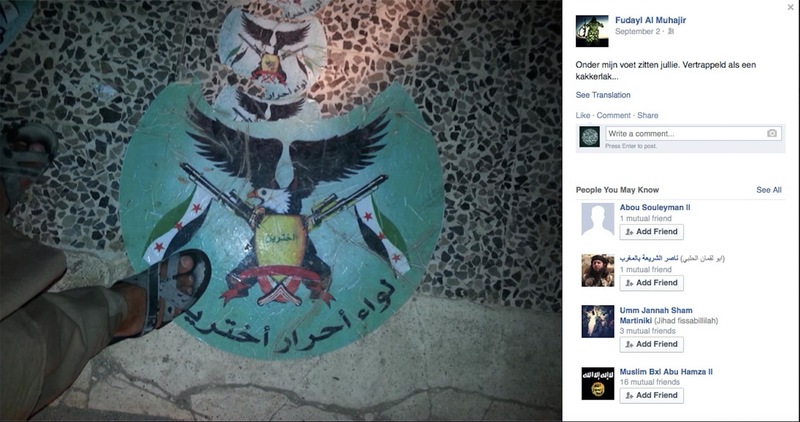 At that time however, Jadaoun posted a picture on Facebook showing the mutilated corpse of a YPG fighter, commenting that it was his very first victim. “I could approach him while he kept the watch and shot the dog from within ten meters”, he boasted — not exactly what a medic typically does. What he told his interrogators about the hospital in Mosul, is confirmed by other sources however. He mentioned that it was lead by an Indian doctor known as Abu Hamza al-Hindi — while shortly afterwards an audio message by another Indian IS member eulogized an Abu Hamza al-Hindi who reportedly had died while the hospital the managed was bombed. The Belgian has met at least one of the people suspected of directing the Brussels and Paris attacks: Abdelilah Himich, a former French soldier thought to be the ‘Abu Suleyman’ calling with the terrorists during the Bataclan siege. 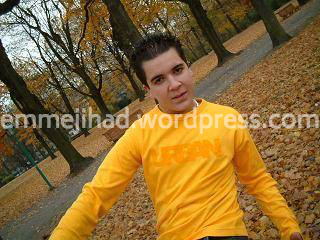 Jadaoun knew Himich by his nickname ‘Nescafé’ — “because he was hyperactive and consumed large quantities of caffeine” — but he did not confirm Himich’s involvement in the attacks. “Nescafé came to Mosul as the military emir of the Tariq ibn Zayid battalion mid-to-late 2016”, he only recalled. “He participated in the defense of Fallujah and after IS was defeated there, he was exhausted from fighting. 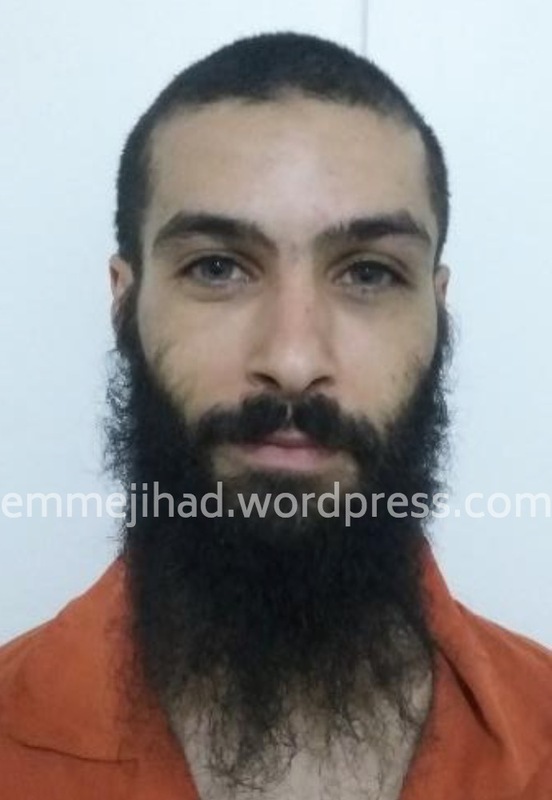 He did not return to Mosul, but went to Syria instead without approval of IS” – which would mean that one of the most wanted European IS operatives became a deserter. Jadaoun badly wanted to become a terrorist himself. In 2015, he heard that Abdelhamid Abaaoud – the Belgian field commander of the Paris attacks – was searching perpetrators for attacks on European soil. While Jadaoun insists that he has never met Abaaoud, he did submit his candidacy to Abu Abd al-Hamid al-Shishani, whom he identified as the emir of the Abu Mutaz al-Qurashi division, the entity in control of all IS foreign fighters. But his offer was refused. Apparently, Jadaoun was meant to become a coordinator instead. “He is groomed to be the next Abaaoud”, a former IS member told us in 2016. Jadaoun did not confirm that during his interrogations, but he told extensively about his use of social media to recruit attackers in the West. He ran at least fifty different Facebook accounts and was active too on Telegram, where he was cautious enough to set the self-destruction tool for what he wrote at 30 seconds. At a certain point, he sent a detailed manual for the production of explosives to an IS supporter in Europe who told him that he had recruited a suicide bomber already. “I don’t know how that plot ended”, Jadaoun said. He also admitted that he was in touch with the two perpetrators of the July 2016 Normandy church attack, the murderer of a French police man (likely the June 2016 Magnanville attack) and with two of the women behind the September 2016 Notre Dame Cathedral bombing attempt. All these plots were previously attributed to the French ‘remote-controller’ Rachid Kassim, who also operated from Mosul — but Jadaoun didn’t mention Kassim and failed to confirm that these remote-controlled attacks have been a full-fledged part of the ‘external operations division’ within IS for which he closely worked together with Kassim. In his interview with Belgian state television, Jadaoun proposed to cooperate with security services in order to avoid new attacks, because IS “still has people hidden in Europe”. The Belgian prime minister Charles Michel refused the offer immediately. “We don’t negotiate with terrorists”, he said. The interrogation reports suggest that Jadaoun has little to offer. Explicitly asked in November of last year, he denied any knowledge about future attacks or people still busy with that. But it is possible of course that Jadaoun wanted to keep his most valuable knowledge as a leverage. It is suspicious at least how he remembered tiny details about individuals who are dead or defected already, while he couldn’t recall elementary facts about other, often more important people. 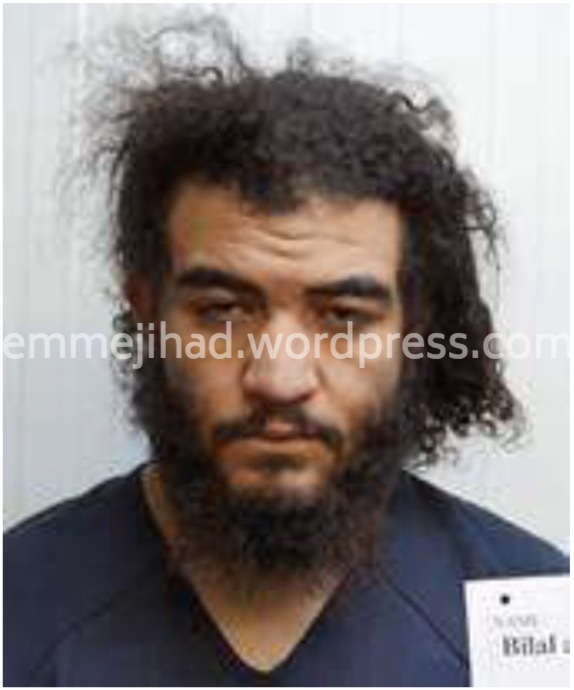 His description of the Egyptian emir who gave him a job in the Education department for instance, makes it fairly easy to identify the man as a well-known veteran of the jihad – the German citizen Reda Seyam. But Jadaoun pretended to know almost nothing about him. 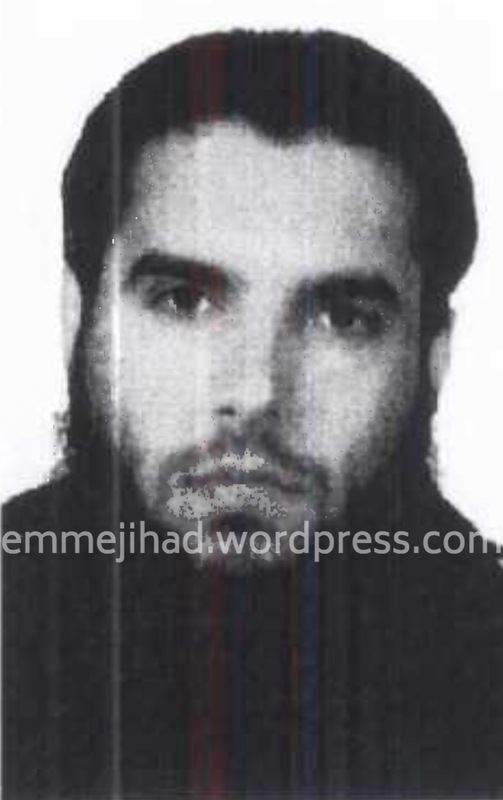 He flatly denied that he ever has heard about Ahmed Dahmani or Ahmad Alkhald, two suspects for the Paris attacks who are still alive — and the same goes for Abu Fudayl al-Maghribi, likely his compatriot Bilal El Marchohi, with whom he appeared on the same wanted notice that lead to the evacation of a Paris train station in May 2017. The latest update of our database on Belgian foreign terrorist fighters added a significant number of Russian sounding names. People rooted in the former Soviet Union and Eastern Europe are still a small minority — but worth a closer look. Belgian authorities have started to disclose identities of foreign terrorist fighters who weren’t prosecuted yet, forced to do so in order to freeze their assets. Using a law from 2006, they can only impose “specific measures against certain people and entities in the fight against the financing of terrorism” when the names are published in the official journal ‘Belgisch Staatsblad/Moniteur belge’. That has happened now for 251 individuals, and a well-informed security source confirmed to us that all of them are “related to the current foreign terrorist fighter phenomenon”. These disclosures have enabled us to fill a lot of blanks — or more precise: anonymous records in our own database. That consists of 621 individuals now, with a somewhat broadened definition as the one we earlier used — see below. About 30 people seem to have roots in the former Soviet Union or Eastern Europe. 22 are certainly of Russian descent – including 12 from Chechnya, 4 from Kalmykia (including two children), 2 from Ingushetia, 1 from Dagestan and 1 from Kabardino-Balkaria. Furthermore, 2 have roots in Kosovo, 1 in the Former Yugoslav Republic of Macedonia, and 1 in Albania. It may be small, this ‘Eastern contingent’, but it is likely underestimated too. It is extremely difficult to investigate, as was proven at the trial of some people belonging to what seems the most important ‘Eastern’ network in Belgium. In December 2016, the main defendant Chalil Man, pictured here in court, was sentenced to ten years in jail for being its leader. But at the trial in appeal in June 2017 even his identity wasn’t certain anymore. “The defendant was known under the aliases Darra, Mohmad, Abdul Azis and Umar”, the written verdict states. “And his real identity is very doubtful, since an authentic Russian passport was found with the picture of the defendant and the name of Magomed Saidov, born on the 29th of April 1964. But possibly this name is also false.” That uncertainty however didn’t prevent the court to raise Chalil Man’s sentence to twelve years. At the trial, Man was described as an example of the people “who are the liveblood of the harrowing conflicts taking place now in Syria and Iraq”. He was identified as a veteran of the jihad, often bragging about his experiences in Pakistan. He went to Syria himself in the early days of the war, but soon came back to act as a recruiter and an organizer. In order to facilitate the travel of fighers, he even bought an apartment in the Turkish town of Körfez. Man recruited for the Sunni Islamist militia Jaysh al-Muhajireen wa’l-Ansar (JMA), it was told, and he followed its leader Tarkhan Batirashvili – a citizen from Georgia with an ethnic Chechen background, better known as Abu Omar as-Shishani – when the latter joined Islamic State. “He acted as a leader of JMA abroad”, court documents state about Man, and his apartment has provided shelter to notorious people such as Aslan Sigauri, once named by Russia as one of the 52 most dangerous rebels in the Northern Caucasus. Chalil Man was also linked to Tourchaev Khassanbek, a man arrested in Greece on the 27th of January 2014 while he tried to cross the Turkish border with some military equipment. Khassanbek is listed as a foreign terrorist fighter in France and apparently lived in Lingolsheim near the city of Strasbourg. During his many travels back and forth between Belgium and Turkey, Chalil Man even visited Malaysia once for a stay of only five days. The network led by Chalil Man has all the characteristics that seem typical for the recruitment efforts in the Russian and Eastern European Muslim communities in Belgium. All of it is happening independently from other local organizations, where people with a Chechen background for instance are extremely rare. We know only one in the two major networks: Magomed Saralapov, a Shariah4Belgium recruit who was present at the foundation of Islamic State. The so-called Zerkani network apparently has none. Most of the Eastern contingent’s networks seem to operate in a very covert manner. They do not expose themselves with propaganda, as Shariah4Belgium did — and even its individual members rarely show themselves off on social media, as many Zerkani followers did. And if they do so, they are still protected by a language barrier. An example of that is the ‘Islamsko Romani Dawetsko Organizacija Belgija’ (IRDO-Belgija), an Islamist group within the Romani gypsy community. That organization was put in the spotlights in 2013 already, when we exposed it as a platform for jihadist preachers from the Balkans. A lot of its activity was openly announced and shown in YouTube videos. But because all communication happened in languages such as Albanian and Bosnian, it was difficult to assess – and only in December 2016 a series of arrests made clear that at least one member – the ethnic Kosovar Mahid Dibrani – had been fighting in Syria. Another characteristic of the Eastern networks is that they are very much spread throughout Europe. More than the major jihadist networks in Belgium, it seems — where the top of course has international connections, but people at the lower levels significantly less. The transnational orientation of the Eastern network is likely caused by the limited size of its respective communities, resulting in a more intense cross-border interaction not only in jihadist circles. Jihadists of Chechen origin in Belgium quite often are connected with like-minded Chechens in Austria, for instance. A recent example is Adam Abdulkhadzhiev, a Chechen native who had lived in Belgium since he was eleven years old. He married a woman of Chechen descent twelve years his senior in the Austrian town of Baden and planned to leave with her for Syria, it appeared when both were arrested by the Austrian police in the fall of 2016. An older case in which Chechens from Belgium and Austria were involved, was that of an Antwerp based group arrested in 2010. 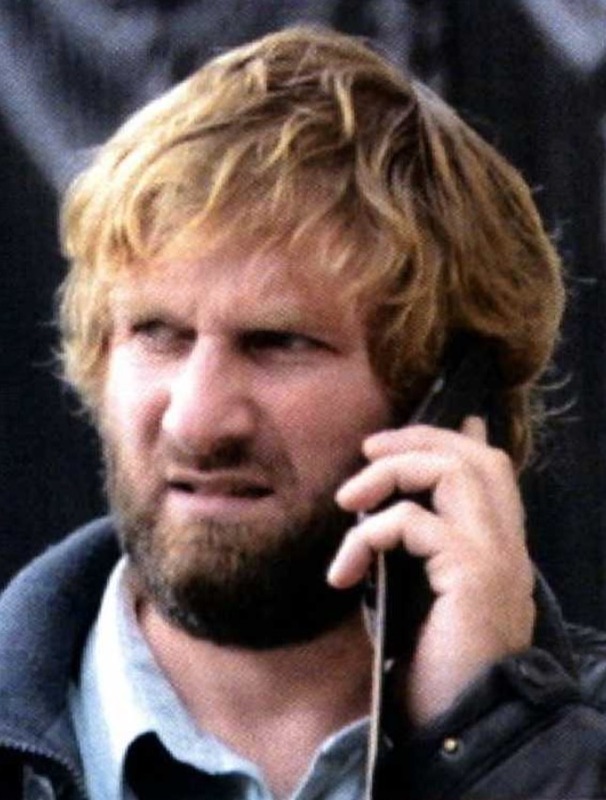 As an exception, it was made up of Moroccans and Chechens, recruiting for jihad and also plotting an attack “bigger than that in Madrid” – a reference to the March 2004 bombing in which 191 people died – intercepted phone calls learned. One of the defendants was Aslambek Idrisov, a Chechen living in the Austrian town of Neunkirchen. At the first trial in 2012, Idrisov was acquitted. But in 2014 he was sentenced on appeal to seven years in jail. 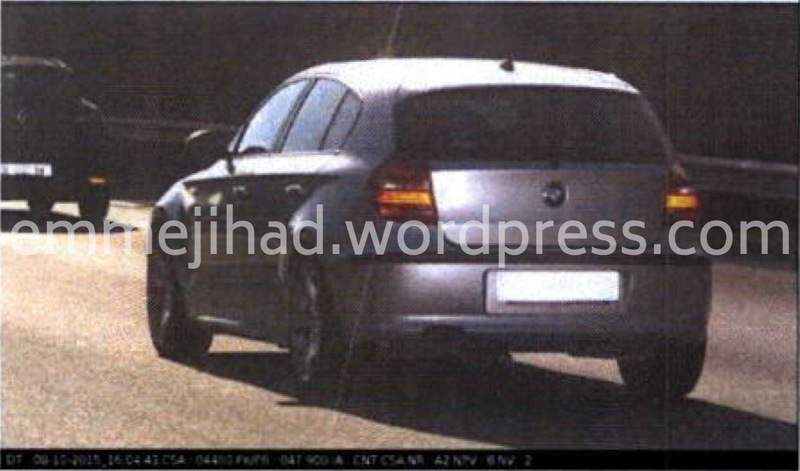 In 2008, Idrisov had been arrested in Sweden already while traveling in a car that was loaded with weapons. He was in the company of fellow Chechen Akhmad Chatayev. That same Akhmad Chatayev was identified in 2015 as the commander of the Yarmouk Battalion, a Chechen faction of Islamic State, and in 2016 he was named as mastermind of the Istanbul airport attack in which 44 people died. From a lot of ‘Easterners’ whose names are now on the official list of Belgian foreign terrorist fighters, very little is publicly known. That is the case with 70 year old Danga Youssoupger, a Chechen interviewed by a Belgian newspaper in 2007 about his work as a horticulturalist in a social project in Antwerp — and with Bisera Gerasimovska, an 18 year old girl from Macedonia who told on social media a few years ago that her life in Belgium was “super cool”. Up till now, we have no clue about what has brought these people into jihad. 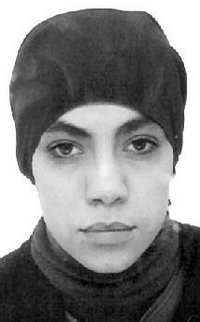 An intriguing case is that of Ramzan Makhauri and Islam Borchashvili, who were reported missing back in 2010 while traveling together on a train from Belarus to Moscow, and now have their assets frozen in Belgium. The same goes for Aslan Chamutaev, who came back in Belgium in May 2013 after being arrested in Greece and threatened with extradition to Russia – a move he could reportedly avoid thanks to interference by the United Nations refugee agency UNHCR. There are also ‘Easterners’ in our database of Belgian foreign fighters who haven’t appeared yet on official lists. An example is Denis Pershin, a native of the Kabardino-Balkar Republic within the Russian Federation, arrested there in December 2015. He reportedly converted to Islam while living in Belgium, studied at a religious school in Egypt and went to Syria for the jihad. In August 2016, the man with dual Belgian and Russian nationality was convicted to four years in jail. But again, we haven’t found any detail about how he would have been radicalized while living in Belgium. with a clear intention to join a local fighting party there, be it as a fighter themselves or in any other role – including family members who may have been forced into the conflict zone. While it has to be stressed that this definition isn’t limited to Sunni Islamists, they are the main focus of our research and actually 612 (or 98.5% of all our 621 records) can be considered as such. 289 at least have joined Islamic State, while the last known affiliation of 50 individuals is Jabhat an-Nusra — the Syrian al-Qaeda affiliate — or one of it’s subsequent forms. While the share of women was 15% in our previous update, that has risen now to 18%. We do know about 38 children – not counting those who may have been born after their parents have left, and sometimes came back with them. In terms of recruitment, Shariah4Belgium remains the most important actor with 101 individuals in whose departure it was implicated. The so-called Zerkani network can be held responsible for 85 departures. Since many of our recent additions weren’t detailed enough to assess their status of departure, we have introduced a category ‘unknown’ for that – and after a review of all our records, our estimate of people who have reached the battle zone was lowered to 478. Of those who certainly didn’t succeed, 45 were stopped abroad and 22 in Belgium. Of those who reached the conflict zone, at least 102 have returned and 129 were reportedly killed. 119 of those deaths have happened in the conflict zone, while 10 individuals were killed after their return to Europe as part of a terrorist plot. A complete list of the deceased is added below – but it has to be stressed more than ever that most deaths cannot be verified, and examples are known of fighters who faked their death to lure security services. Belgian authorities have added 37 names to the list of persons whose financial assets are frozen as part of the struggle against terrorism. 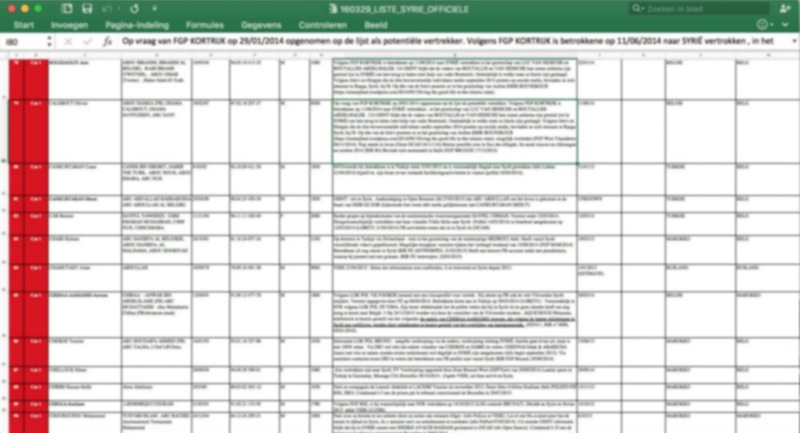 All 251 people listed now are considered foreign terrorist fighters, mainly active in the Syrian-Iraqi conflict. This latest update does include Amor Ben Mohamed Sliti (57), a true veteran of the Belgian jihad. In the nineties, Sliti was living in Brussels — coming from Tunisia, but naturalized as a Belgian citizen and working in his own automobile repair shop. Late in 1999, he left for Afghanistan with his wife and five children, then aged 2 to 13. It is said that he wanted to start a restaurant and butcher shop in Kabul. But finally he joined al-Qaeda while settling in Jalalabad. Sliti quickly adapted to the moral standards of the terrorist group by offering his 13 year old daughter as a bride to a Tunisian fighter, Adel Hkimi. Soon the teenage girl became pregnant, but Hkimi never saw his newborn daughter. He was caught shortly after the American invasion of Afghanistan had started at the end of 2001, and by February 2002 he was imprisoned at Guantánamo Bay. That same fate also met a cousin of Sliti. While living in Italy, Hicham Ben Ali Ben Amor Sliti badly became addicted to drugs. His family sent him to Brussels in order to work in his cousin’s car repair shop as a sort of rehab. But when Amor Sliti left for Afghanistan, he could persuade his cousin that there was no better place to become a decent man — which resulted in twelve years Guantánamo for Hicham. Amor Sliti kept himself out of the American’s reach. He was caught in February 2002 at the Pakistani-Iranian border and extradited to Belgium. There he was tried in 2003 as an accomplice of Nizar Trabelsi and Malika El Aroud. The latter is the widow of a suicide bomber who killed the Afghan warlord Ahmed Shah Massoud — an ally of the West against the taliban — while Trabelsi planned to blow up an American air base in Belgium. Sliti was convicted to five years in jail. In December 2010, he also was stripped from his Belgian citizenship — until today one of only four cases. When and how exactly he got involved again in the jihad remains unclear. 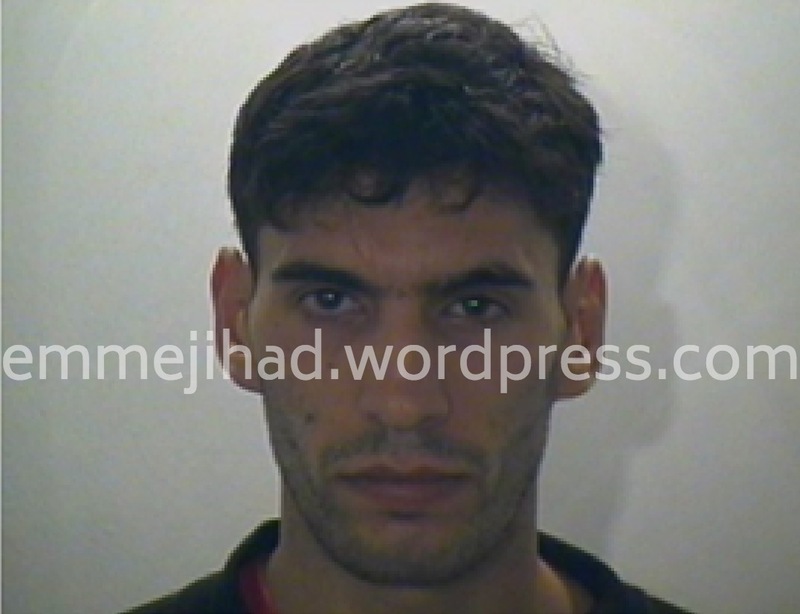 But it is told that cousin Hicham also has become an ardent supporter of Islamic State after his transfer from Guantánamo to Slovakia in 2014. 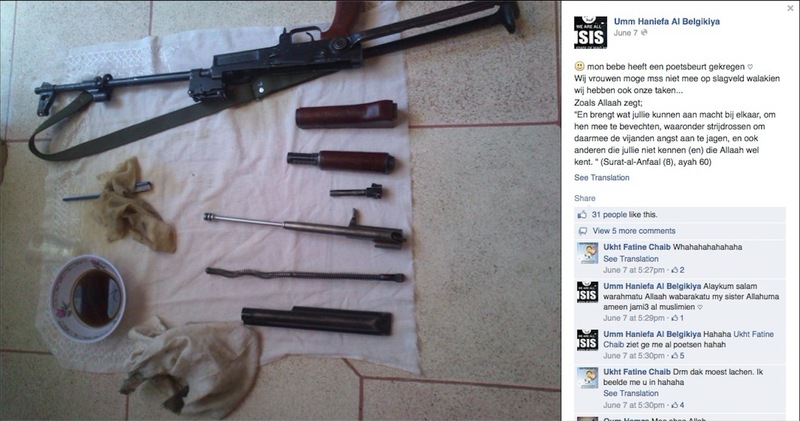 Sliti isn’t the first veteran of Belgian jihad who has surfaced in the ranks of the Islamic State. Earlier, Abdelkader Hakimi was already added to the official Belgian foreign fighters list. 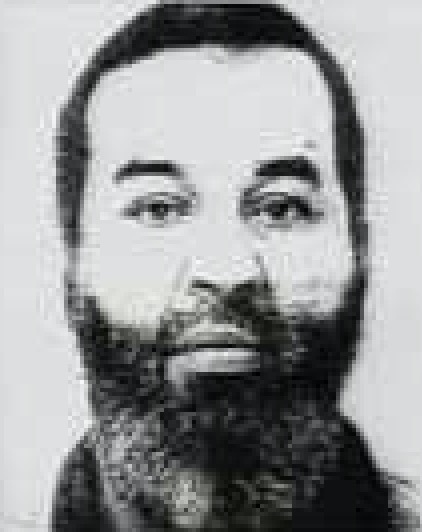 Hakimi was a heavyweight of the ‘Groupe Islamique Combattant Marocain’, convicted to eight years in jail by a Belgian court in 2006. In 2014, we revealed that he was in Syria, surrounded by a new generation of Belgian Islamic extremists. It is well known by now that European veterans often play important roles within the Islamic State. Good examples are two former residents of France, Abdelnasser Benyoucef and Boubaker el-Hakim. The latter was considered as one of the leaders of the Amniyat — Islamic State’s security service — at the moment he was killed in November 2016, while Benyoucef is said to have lead Islamic State’s elite brigade Katibat al-Battar. It was brought to our attention only very recently, that the Abdel Kader Hakim declared dead by coalition forces in December 2015 might be the Hakimi mentioned above. 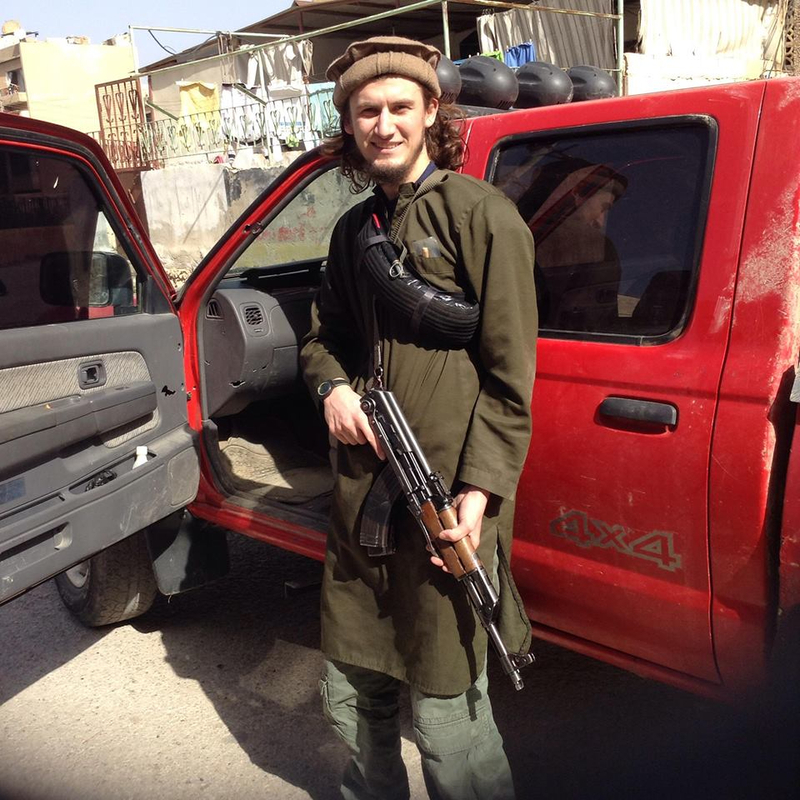 It would mean that this Belgian veteran also had an important position in the Islamic State’s external operations. The coalition’s press desk couldn’t confirm or deny however, when asked last month whether it was the Belgian Hakimi killed in 2015.